Jeremiah Owyang has a radical prediction: “A savvy, progressive hotel will partner with the crowd and franchise them.” Not only does Owyang predict this; he recommends that hotels do this. “What hotel companies need to do is pilfer and siphon the top Airbnb hosts from each major city,” he said, in a phone interview late last week. In return for property owners listing their properties on a hotel’s site rather than Airbnb, the hotel provides them with access to its supply chain, bedding, soaps and a key draw–access to loyalty member guests. And what do the guests gain from this transaction? “They want that local unique experience. But now it’s certified by Marriott or W. Hotels can upsell their value-added services and soaps, things like that, and they can get at least a 10% revenue cut from a transaction they were never going to get,” Owyang explains. As a former Forrester analyst, founding partner of Altimeter Group and now founder and chief catalyst of Crowd Companies, Owyang has years of experience and data to draw from in making such predictions. Many have been right on the money, a few not so much (he mentions Google+ in the not so much category). The following visualization shows the collaborative economy as being organized into six distinct families, and it includes example companies that represent just a fraction of the more than 9,000 companies included in the full Mesh Directory maintained at http://meshing.it/companies. Brand Council: Large brands pay to be members of this council. Pepsi recently signed up; other major brands include Visa, MasterCard, PayPal, Verizon and Wells Fargo. Innovation Network: Startups, solution providers, investors, thought leaders and others are hand-selected to join this network, which partners with large brands to help brands identify how to tap into the collaborative economy. Educational services: Access to research analysts, workshops, reports, and others in a private setting. Given the past media scrutiny of other organizations, Owyang is explicit about ownership (the company is entirely owned/funded/bootstrapped by Owyang) and funding (all money comes from membership on the brand side, and from speeches and workshops). In short, Owyang is very clear on a key point: He serves the brands. Central to Crowd Companies’ philosophy is empowerment, changing the relationships between brands and the crowd. “If you think of the crowd as your partners versus someone who’s disrupting you, and if you leverage what they’re doing, your brand is now resilient,” Owyang explains. Hotels are dipping their toes into the collaborative economy waters (examples include the Redmond Marriott Town Center’s Workspring on-demand office space and Uber’s partnership with the Cosmopolitan Hotel of Las Vegas earlier this year for a #VegasOnDemand promotion). But it’s not enough, according to Owyang. 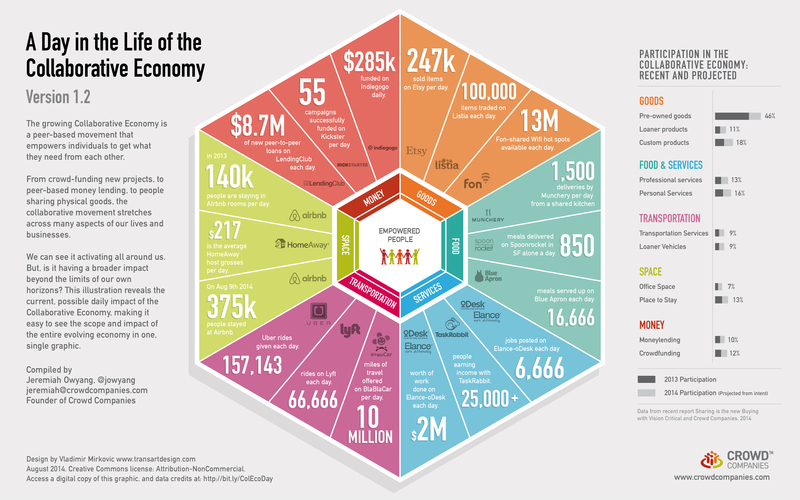 He mentions the following data points, the first two of which are illustrated in an infographic entitled A Day in the Life of the Collaborative Economy. In 2013, 140,000 people stayed at Airbnb rooms per day. On August 9 this year, 375,000 people stayed at Airbnb rooms. A study by Boston University published in January this year estimated that for every 1% increase in Airbnb listings, there is a half point decrease in hotel revenues. The estimate is compounded by Airbnb’s growth. Assume that an average hotel room costs $150 per night, including taxes, food, and fees. Now, multiply the Airbnb August 9th figure of 350,000 by $75/night for a hotel room. Do the math and it goes without saying that a lot of lost revenue is involved (hence Owyang’s pilfering and siphoning recommendation for hotels). Partnerships such as the one between Quirky and GE are examples of efforts to connect companies with the crowd. Quirky, a crowdsourced invention startup, received $30 million in funding from GE to partner in releasing a roster of connected home products. In this partnership, Quirky is the bridge that connects the crowd with a major company, GE. Anyone can submit ideas to Quirky. A small team at Quirky reviews the submissions, selects those it determines to be the most promising, and starts prototyping. After refinement and branding, the finished products go to market. In return, Quirky can access GE’s patents and leverage GE’s quality assurance program, massive supply chain, regulatory knowledge and marketing machine. There have been setbacks along the way, such as the loss of some 500 GE appliance patents, with the sale of Electrolux. Even with the real and potential setbacks that accompany any major shift in business, brands should consider this question: In the age of the collaborative economy, can they afford not to partner with the crowd? Jeremiah Owyang was a keynote speaker at the Seattle Interactive Conference (SIC) 2014, which takes place on October 15 – 16 at the Conference Center at the Washington State Convention Center. At the conference, Owyang gave a talk entitled The Future of Business Models: The Crowd. For more information about Owyang, see the Crowd Companies website and his Web Strategy blog. I'm a former co-editor of Flip the Media, and an inveterate traveler and storyteller. If it involves crafting compelling stories and images, I'm in. As an unabashed idealist, I'm also a believer in in the power of the media and arts to effect positive social change.